Please give at least 1 week notice for orders of special items or large quantities. 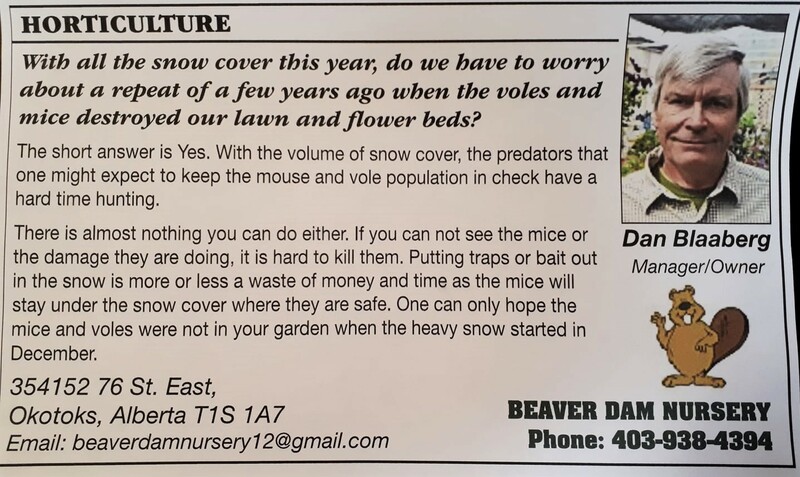 With all the snow cover this year, do we have to worry about a repeat of a few years ago when the voles and mice destroyed our lawn and flower beds? The short answer is Yes. With the volume of snow cover, the predators that one might expect to keep the mouse and the vole population in check have a hard time hunting. There is almost nothing you can do either. If you can not see the mice or the damage they are doing, it is hard to kill them. Putting traps or bait out in the snow is more or less a waste of money and time as the mice will stay under the snow cover where they are safe. One can only hope the mice and voles were not in your garden when the heavy snow started in December.